This mulitbeam sonar image shows the San Andreas Fault cutting through the head of Noyo Canyon, offshore approximately 12 miles northwest of Fort Bragg, Calif (map). For the first time, scientists are using advanced technology and an innovative vessel to study, image, and map the unexplored offshore Northern San Andreas Faul from north of San Francisco to its termination at the junction of three tectonic plates off Mendocino, Calif. The team includes scientists from NOAA’s National Marine Fisheries Service, Oregon State University, the California Seafloor Mapping Program, the U.S. Geological Survey and Woods Hole Oceanographic Institution. The expedition which concludes Sunday is sponsored by NOAA’s Office of Ocean Exploration and Research. While the fault on land is obscured by erosion, vegetation and urbanization in many places, scientists expect the subsea portion of the fault to include deep rifts and high walls, along with areas supporting animal life. The expedition team is using high-resolution sonar mapping, subsurface seismic data and imaging with digital cameras for the first-ever three-dimensional bathymetric-structural map that will model the undersea Northern San Andreas Fault and its structure. Little is known about the offshore fault due to perennial bad weather that has limited scientific investigations. By relating this 3-D model with ongoing studies of the ancient record of seismic activity in this volatile area, scientists may better understand past earthquakes — in part because fault exposure on land is poor, and the sedimentary record of the northern California offshore fault indicates a rich history of past earthquakes,” said Chris Goldfinger, co-principal investigator and marine geologist and geophysicist at Oregon State University in Corvallis, Ore.
More than a century after the 1906 Great San Francisco Earthquake, the science team is also exploring the fault for lessons associated with the intertwined relationships between major earthquakes and biological diversity. Evidence shows that active fluid and gas venting along fast-moving tectonic systems, such as the San Andreas Fault, create and recreate productive, unique and unexplored ecosystems. “This is a tectonically and chemically active area,” said Waldo Wakefield, co-principal investigator and a research fisheries biologist at NOAA’s Northwest Fisheries Science Center in Newport, Ore.
Elizabeth Clarke, a NOAA fisheries scientist, is coordinating Lucille’s operations and obtaining photographic information about fauna associated with the fault. The AUV and its sensors can dive to nearly one mile (1,500 meters), but depths associated with this expedition will range between approximately 230 to 1100 feet (70 to 350 meters). Early in the expedition, scientists collected bathymetric and subsurface seismic reflection data to guide them to specific areas of interest for follow-on and more detailed operations. The AUV’s high-definition cameras are obtaining multiple images to be stitched into “photo mosaics” showing detailed fault structure and animal life. The first part of the expedition is operating from Research Vessel Derek M. Baylis, a “green” research vessel primarily powered by sail and owned by Sealife Conservation, a nonprofit organization. The expedition will track the carbon footprint of the 65-foot energy efficient Baylis and compare results to conventional vessels. AUV operations are being conducted aboard the Research Vessel Pacific Storm, operated by Oregon State University’s Marine Mammal Institute. The ship and AUV team joined the expedition offshore of Fort Bragg on Sept. 25.
International Battery is planning to run boats and large yachts on batteries. The U.S. manufacturer, designer and developer of large-format batteries and energy storage units said it is joining hands with Electric Marine Propulsion to build hybrid power units for big boats and yachts. The partnership with EMP will aim to build a hybrid power train for the world's largest plug-in, hybrid-electric sailboats -- a 60-foot Tag Yachts catamaran that runs on wind-generated electricity stored in International Battery's lithium-ion batteries. "The initial thrust and response when engaging forward is vastly better than anything experienced with standard diesel propulsion," said Tim van der Steene, managing director of Tag Yachts. "It's quiet and the power is there instantly. It goes hand-in-hand with sailing, which is about moving in harmony with nature, quietly, without polluting the environment." When there's not enough wind, twin 22-kilowatt diesel generators kick in automatically for recharging, together or individually as needed. The generators are 144-volt direct-current units that recharge the batteries directly without the normal energy loss incurred through a charger. The batteries also can be charged with a 144-volt charger that plugs into shore power. The charger handles a wide range of voltages and frequencies, a big advantage in out-of-the way ports with erratic supplies of electricity. Analysts said the latest project could signal major changes in shipping and maritime transport, with the promise of reduced risk of pollution from fossil fuels. International Battery CEO Ake Almgren said the large-format lithium prismatic cells could be used as the building blocks for battery systems with high energy density -- "which means smaller footprints and lower weight." "Because we use a unique, environmentally friendly, water-based manufacturing process, our batteries will feel right at home storing clean, renewable energy for this hybrid vessel and others to follow," said Almgren. Tang's hybrid system includes twin E motion 18-kilowatt permanent-magnet motors and International Battery's lithium cells configured into a 144-volt battery pack. The pack's total energy capacity is a hefty 46 kilowatt-hours. That's more than twice the usable capacity of an 8D battery pack -- the largest conventional size carried with the E motion system. Yet the lithium pack weighs roughly 40 percent less. The company said the extra energy capacity would allow the sailing yacht to offer more luxury and power hungry amenities to passengers including a large flat screen television set, entertainment system, lighting, cafe-standard espresso machine, refrigerator-freezers, dishwasher, microwave, conventional oven, gas or electrical burner top, washer-dryer, air-conditioning and a water maker. 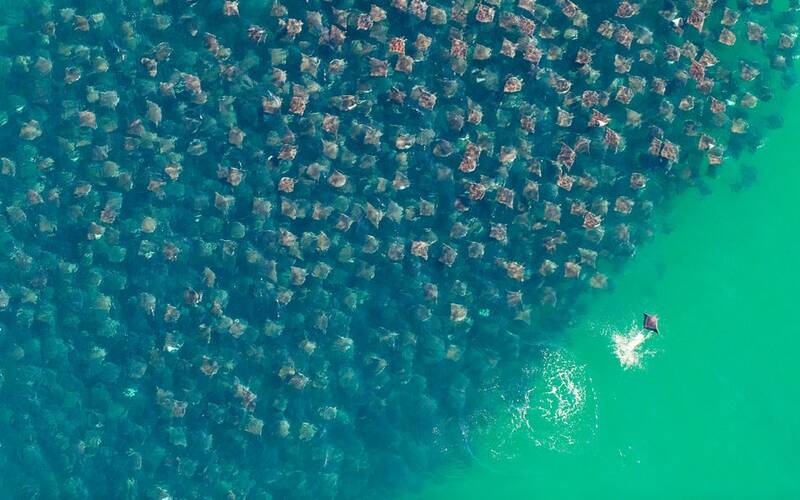 Image of the week : "Flight of the Rays"
Thousands of Munk's devil rays crowd the Sea of Cortez off Mexico's Baja California Sur state (map) in 2009. The aerial image won top honors and the "Underwater World" category in the 2010 Environmental Photographer of the Year awards. German photographer Florian Schulz said the scope of the ray congregations was unknown until he and a pilot happened upon the gathering while searching for migrating whales. Perhaps just as rare is the composition Schulz captured. "During an aerial expedition I came across something I had never seen before. Not even my pilot, who has surveyed this area for 20 years, had seen anything like it. As we got closer we started to discover its nature: an unprecedented congregation of rays. The group was as thick as it was wide, all heading towards the same direction. I have asked around why this took place but no one has been able to explain it to me. After such a unique sighting, I realize there are so many marvels in the oceans that we are yet to understand. I was able to show how these rays are jumping out of the water, he said, and at the same time I'm able to show—almost like an underwater photograph—how there're layers and layers and layers of rays." The International Union for Conservation Union lists Munk's devil rays as near threatened, due in part to their vulnerability to gill nets—hard-to-see "curtains" of netting. Given ray gatherings like the one pictured, Schulz said, "you could imagine a single net could take thousands and thousands." This helps explain why, upon seeing the winning photo, marine ecologist Giuseppe Notarbartolo di Sciara emailed Schulz to express his delight at seeing so many Munk's devil rays thriving in a single frame. Di Sciara helped identify the species in 1987. This year's edition drew more than 4,500 entries from photographers in 97 countries. 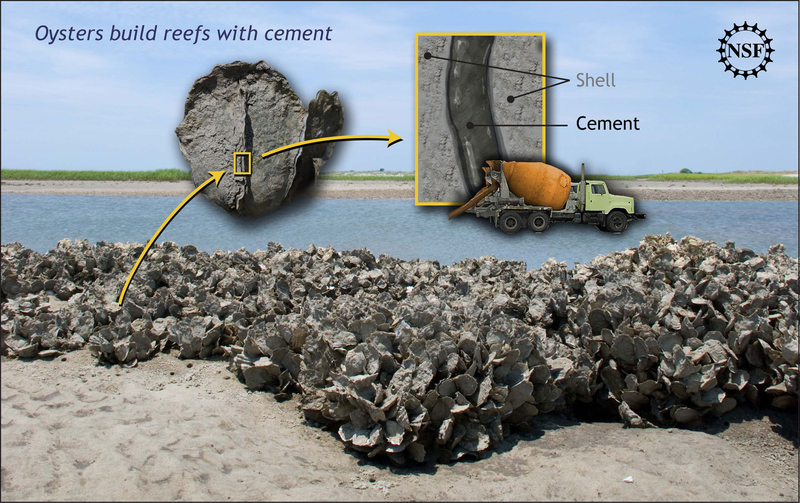 Oysters build their reefs--such as this one on the South Carolina coast--using a specialized cement, one that differs in composition from their shells, as well as from other marine organism adhesives. Researchers have discovered what makes up the cement-like adhesive that oysters use to stick together, paving the way for advances in less-harmful boat protection, medicine and construction. Because oysters produce the adhesive to stick to one another, by understanding what the adhesive is made of, researchers can develop ways to prevent oysters from sticking to boats, develop adhesives that work in wet situations and help efforts to boost oyster populations. A research team led by Purdue University professor Jonathan Wilker looked at the Eastern oyster, the most common type in the United States, and found that its adhesive is about 90 percent calcium carbonate, or chalk. The remaining amount is protein that is similar to the glue that mussels produce. The researchers said the inorganic adhesive made by oysters is harder than the organic adhesives that mussels and barnacles use, making it more like cement, while the mussel adhesive is like a glue. Knowing how oysters stick together can help understand how to keep them from sticking to boats. Current methods for keeping oysters and other species off of ships are a major expense and use toxic substances and copper-based paint, which can kill organisms' larvae. "If we could figure out a non-toxic a way to defeat the adhesives, we could keep them off ships without harming the environment," said Wilker, who has worked on synthetic bioadhesives for more than a decade, said in a news release. The development of adhesives that can set and hold in wet environments could also be beneficial for dentistry and medicine, where they could replace staples and sutures, leaving out the potential for infection. The research team, funded by the Office of Naval Research and the National Science Foundation, included Purdue graduate students Jeremy Burkett and Lauren Hight, and Paul Kenny of the Baruch Marine Field Laboratory at the University of South Carolina. The team's findings were published in the Journal of the American Chemical Society. This would have enabled people to walk across exposed mud flats to safety. The results are published in the open-access journal Plos One. The researchers show that a strong east wind, blowing overnight, could have pushed water back at a bend where an ancient river is believed to have merged with a coastal lagoon. With the water pushed back into both waterways, a land bridge would have opened at the bend, enabling people to walk across exposed mud flats to safety. As soon as the wind died down, the waters would have rushed back in. The study is based on a reconstruction of the likely locations and depths of Nile delta waterways, which have shifted considerably over time. "The simulations match fairly closely with the account in Exodus," said the study's lead author Carl Drews, from the US National Center for Atmospheric Research (NCAR). The study is part of a larger research project by Mr Drews into the impacts of winds on water depths, including the extent to which Pacific Ocean typhoons can drive storm surges. By pin-pointing a possible site south of the Mediterranean Sea for the crossing, the study also could be of benefit to archaeologists seeking to research the account. In the Book of Exodus, Moses and the fleeing Israelites became trapped between the Pharaoh's advancing chariots and a body of water that has been variously translated as the Red Sea or the Sea of Reeds. In a divine miracle, the account says, a mighty east wind blew all night, splitting the waters and leaving a passage of dry land with walls of water on both sides. The Israelites were able to flee to the other shore. But when the Egyptian Pharaoh's army attempted to pursue them in the morning, the waters rushed back and drowned the soldiers. Other scientists have also sought to explain the account through natural processes. Some have speculated that a tsunami could have caused waters to retreat and advance rapidly. But the scientists behind the latest research point out that such an event would not have caused the gradual overnight divide of the waters or have been associated with winds. Other researchers have focused on a phenomenon known as "wind setdown," in which a particularly strong and persistent wind can lower water levels in one area while piling up water downwind. This fascinating creature was discovered in 1998 off the coast of Sulawesi in Indonesia, the mimic octopus is the first known species to take on the characteristics of multiple species. This octopus is able to copy the physical likeness and movement of more than fifteen different species, including sea snakes, lionfish, flatfish, brittle stars, giant crabs, sea shells, stingrays, jellyfish, sea anemones, and mantis shrimp. This animal is so intelligent that it is able to discern which dangerous sea creature to impersonate that will present the greatest threat to its current possible predator. The Indonesian mimic octopus has the boldest defense strategy of any of its cephalopod cousins, and now scientists know how that strategy evolved. Rather than blending into the scenery, the octopus mimics the swimming behavior and shape of a variety of toxic sea creatures — like flatfish and sea snakes — and displays bold color patterns that shock predators. For the study, scientists focused on mimic’s ability to swim on the sea floor like a flatfish, of which there are several toxic varieties in the region where the octopus lives. first, mimic octopus ancestors started switching on bold colors to shock predators when camouflage failed. next, they learned to swim like sea-floor–dwelling fish and developed longer arms that facilitate the motion. third, they combined the bold color patterns and flatfish swimming technique, and started doing it while out on daily forays and resting. The Indonesian mimic octopus has the extraordinary ability to pass itself off as many of the toxic fishes or sea snakes that share its habitat. Instead of blending into the background, the animal impersonator often uses a daredevil strategy of making itself more conspicuous to predators. Scientists believe the behaviour evolved to scare other animals. By flattening its head and arms, using a bold brown and white colour display and adopting an undulating swimming technique T. mimicus can fool predators that it is, in fact, a poisonous flatfish rather than a tasty meal. Because this high risk defence strategy is quite rare, scientists from the California Academy of Sciences and Conservation International Indonesia were keen to understand how its abilities evolved and why they are used. Dr Christine Huffard from Conservation International Indonesia is one of the authors of the study published in the Biological Journal of the Linnean Society. "The close relatives of T. mimicus use drab colours and camouflage to successfully hide from predators." she said. "Why does T. mimicus instead draw attention to itself, and repeatedly abandon the camouflage abitilies it inherited from its ancestors in favour of a bold new pattern?" By analysing its DNA the researchers established when different traits appeared in its ancestors' lineage from its brown-and-white colour displays to its ability to swim like a flatfish using its long arms. The researchers believe its impersonation skills were advantageous because the mimic could fool predators into thinking it was a poisonous flatfish like the peacock or zebra sole which lives nearby. Dr Healy Hamilton is Director of the Center of applied Biodiversity Informatics at the California Academy of Sciences. "While the mimic octopus's imitation of flatfish is far from perfect, it may be 'good enough' to fool predators where it lives... In the time it takes a predator to do a double take, the octopus may be able to get away," she said. Scientists say the trouble with the reefs is linked to climate change. For years they have warned that corals, highly sensitive to excess heat, would serve as an early indicator of the ecological distress on the planet caused by the buildup of greenhouse gases. “I am significantly depressed by the whole situation,” said Clive Wilkinson, director of the Global Coral Reef Monitoring Network, an organization in Australia that is tracking this year’s disaster. According to the National Oceanic and Atmospheric Administration, the first eight months of 2010 matched 1998 as the hottest January to August period on record. High ocean temperatures are taxing the organisms most sensitive to them, the shallow-water corals that create some of the world’s most vibrant and colorful seascapes. Coral reefs occupy a tiny fraction of the ocean, but they harbor perhaps a quarter of all marine species, including a profusion of fish. Often called the rainforests of the sea, they are the foundation not only of important fishing industries but also of tourist economies worth billions. Coral reefs are made up of millions of tiny animals, called polyps, that form symbiotic relationships with algae. The polyps essentially act as farmers, supplying the algae with nutrients and a place to live. The algae in turn capture sunlight and carbon dioxide to make sugars that feed the coral polyps. The captive algae give reefs their brilliant colors. Many reef fish sport fantastical colors and patterns themselves, as though dressing to match their surroundings. Coral bleaching occurs when high heat and bright sunshine cause the metabolism of the algae to speed out of control, and they start creating toxins. The polyps essentially recoil. “The algae are spat out,” Dr. Wilkinson said. The corals look white afterward, as though they have been bleached. If temperatures drop, the corals’ few remaining algae can reproduce and help the polyps recover. But corals are vulnerable to disease in their denuded condition, and if the heat stress continues, the corals starve to death. In dozens of small island nations and on some coasts of Indonesia and the Philippines, people rely heavily on reef fish for food. When corals die, the fish are not immediately doomed, but if the coral polyps do not recover, the reef can eventually collapse, scientists say, leaving the fishery far less productive. Research shows that is already happening in parts of the Caribbean, though people there are not as dependent on fishing as those living on Pacific islands. It will be months before this year’s toll is known for sure. But scientists tracking the fate of corals say they have already seen widespread bleaching in Southeast Asia and the western Pacific, with corals in Thailand, parts of Indonesia and some smaller island nations being hit especially hard earlier this year. Temperatures have since cooled in the western Pacific, and the immediate crisis has passed there, even as it accelerates in places like the Caribbean, where the waters are still warming. 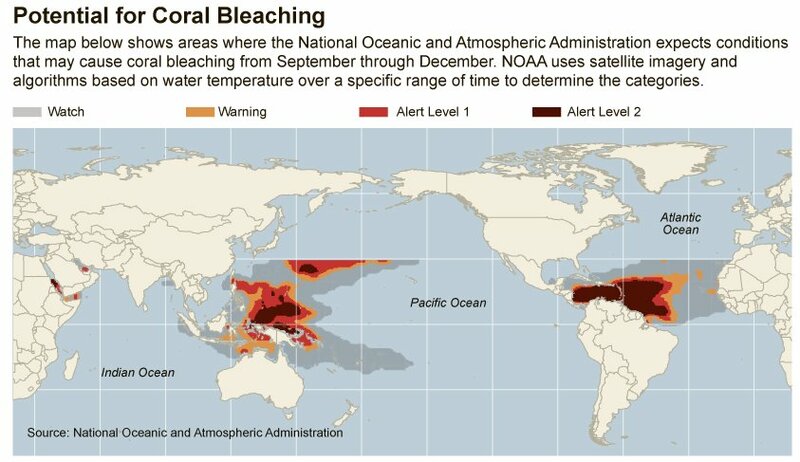 Serious bleaching has been seen recently in the Flower Garden Banks, a marine sanctuary off the Texas-Louisiana border. In Thailand, “there some signs of recovery in places,” said James True, a biologist at Prince of Songkla University. But in other spots, he said, corals were hit so hard that it was not clear young polyps would be available from nearby areas to repopulate dead reefs. “The concern we have now is that the bleaching is so widespread that potential source reefs upstream have been affected,” Dr. True said. Even in a hot year, of course, climate varies considerably from place to place. The water temperatures in the Florida Keys are only slightly above normal this year, and the beloved reefs of that region have so far escaped serious harm. Parts of the northern Caribbean, including the United States Virgin Islands, saw incipient bleaching this summer, but the tropical storms and hurricanes moving through the Atlantic have cooled the water there and may have saved some corals. Farther south, though, temperatures are still remarkably high, putting many Caribbean reefs at risk. Summer is only just beginning in the Southern Hemisphere, but water temperatures off Australia are also above normal, and some scientists are worried about the single most impressive reef on earth. The best hope now, Dr. Wilkinson said, is for mild tropical storms that would help to cool Australian waters.